There are all sorts of different ways of exploring Brittany! During your holiday here, the campsite will regularly organise bike rides along the coast, as well as sea kayak outings. You really will be able to enjoy the coast from a whole new perspective! And the region's great food and culture will also feature strongly, with options of visits to a traditional biscuit manufacturer, or why not have a go at some Breton games? You'll also be able to make the most of the ocean air, with big sports games taking place on the beach! Your summer evenings will be spent in a friendly and family-friendly atmosphere. We invite you all to take part in our activities that are sure to delight young and old. Le Pays de Lorient, which lies in the heart of southern Brittany, in Morbihan, is the perfect place to enjoy some sailing, kayaking and stand-up paddleboarding. Come and visit the Kerguelen watersports centre just 5 minutes from the camping Yelloh! 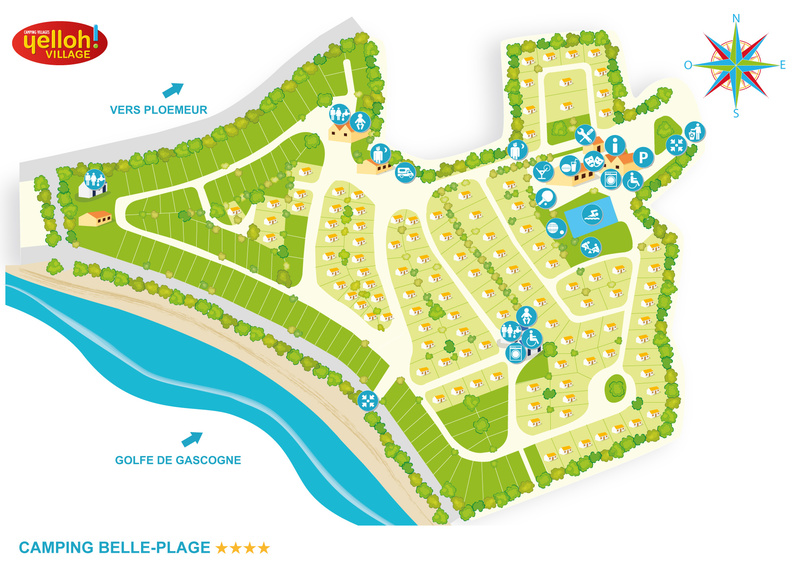 Village Belle Plage. This centre has some amazing lakes which are open to everyone to enjoy (with activities available for 4 year olds and up). Have a go at some water-based activities with the flexible, tailor-made packages available. Whether it's for an hour or for a week, just choose the package you want. See a video of the activities available. Enjoy a bit of diving? Lorient bay has an amazingly varied range of dive sites, many of which enjoy some natural protection , so you've got the best possible conditions whatever the time of year. Diving can be enjoyed around Ile de Groix, which is naturally protected, thereby offering the best possible conditions whatever the time of year. Ocean diving: video. From family outings to sports hiking with bivouacs, sea kayaking is a way of enjoying the coastline of southern Brittany from a whole new angle. For setting off on an outing, please see ! From just having a go to improving your technique, come and discover the coast of southern Brittany and the road that takes you to the beaches of Guidel and its various surf spots. Qualified instructors will welcome you and provide training in some of the area's loveliest locations. Lessons and training are available, depending on your requirements. A first look at some surfing: video. Hiking is the perfect way of discovering the Lorient region in southern Brittany. This region of Morbihan, between Lorient and Guidel, has some highly unusual geographic features, combining ocean, islands, valleys, remarkable rivers and natural spaces, and you'll be constantly amazed by it all. Hiking options organised by the Lorient tourist organisation suggests a wide range of walking circuits, which are connected together by linking routes. Find out about the various circuits ! With their amazing views over the sea and Ile de Groix, the huge greens of Ploemeur look forward to welcoming people who love the countryside and those who enjoy playing on a proper golf course, with the wind and the ocean as prominent features! Golf lovers will be in heaven!